Out in the ocean, stars are dying. Sea stars, more commonly known as starfish, are succumbing in droves to a recently discovered syndrome called sea star wasting disease. Fortunately, Eric Littman, V17, who spent last summer at the Seattle and Vancouver aquariums studying the animals with imaging technology, may have helped find ways to intervene. Sea star wasting disease, the cause of which remains uncertain, has baffled scientists since it first appeared in the summer of 2013. Some species of the affected sea stars act lethargic or have arms that are abnormally curled upward; others abruptly change color. In either case, they develop skin lesions through which their internal organs may eventually fall out. In the end, their limbs detach, and they die. What makes this outbreak so alarming is that it is occurring from Mexico to Alaska and involves more than 20 species, says Littman. Millions have died. Previous incidents of wasting disease were restricted to a very small geographic area and affected only a few species. His summer studies investigated whether sea stars with the wasting disease could be identified before they showed outward signs of it. While early detection won’t benefit sea stars in the wild, it would help aquatic veterinarians care for captive ones, which are getting sick just as much as their wild counterparts. Early indicators of the disease, Littman theorized, could be found in density scans of the sea creatures. His research followed up on the findings of a Monterey Bay Aquarium veterinarian who had seen some decreased density in the bodies of sea stars with the wasting syndrome. Littman’s work was supported by the International Association for Aquatic Animal Medicine and the national AQUAVET program. Felicia Nutter, V93, an assistant professor of infectious disease and global health at Cummings School, hooked up the third-year veterinary student with veterinarians Lesanna Lahner of the Seattle Aquarium and Marty Haulena of Vancouver Aquarium. Under their mentorship, Littman compared images of ailing and healthy sea stars in hopes of finding telltale density variations. He was interested in the tiny bones called ossicles that run throughout their bodies. These vary in shape and size and form the skeletal network that supports a star’s body. One of the biggest challenges Littman faced was how to get images of the ossicles. Mauricio Solano, an assistant professor of diagnostic imaging at Cummings School, gave him tips on how to use software to come up with a range of normal densities for healthy sea stars to compare with the densities of sea stars with wasting disease. Littman had hoped that X-ray, which is inexpensive and widely available, would help him detect the disease, but the invertebrates’ unusual anatomy foiled that plan. “You put a star on a table and shoot a beam down to get one flat picture, but because [all the ossicles] overlap, and not all stars are of uniform thickness, X-ray turned out to be impractical for determining their densities,” he says. CT scans did the job. 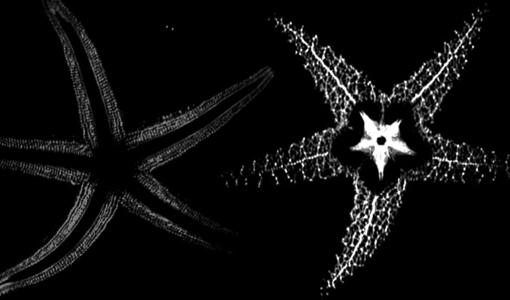 Because a CT scanner takes hundreds of cross-sectional pictures, Littman was able to assess ossicles in several different planes and even in 3-D.
Now back on campus, Littman expects to be first author, with Lahner and Haulena, on a forthcoming paper about how to perform an X-ray on a sea star to diagnose other conditions. He says he hopes to continue working with sea stars and other marine animals. “The ocean covers 70 percent of the earth, and we know less about it than we do about space,” he says.